The aircraft carrier USS Carl Vinson (CVN 70) transits the Indian Ocean, April 15, 2017. Admiral Harry Harris, commander of the U.S. Pacific Command, had announced April 9 he was ordering the strike group to sail north after leaving Singapore and that it would not be making previously planned port visits in Australia. An F/A-18E Super Hornet from the Strike Fighter Squadron (VFA) 137 “Kestrels” takes off from the aircraft carrier USS Carl Vinson (CVN 70) flight deck in South China Sea, April 12, 2017. White House spokesman Sean Spicer noted Trump's comment "that we have an armada going towards the peninsula. That's a fact, it's happened. It is happening rather." “What part is misleading? I’m trying to figure that out…I’m not the one who commented on timing,” said Spicer. U.S. Defense Secretary James Mattis (L) departs after meeting with Saudi Arabia's Deputy Crown Prince and Defense Minister Mohammed bin Salman (R) at the Ministry of Defense in Riyadh, April 19, 2017. Mattis then said, "She will be on her way. And I’ll determine when she gets there and where she actually operates. 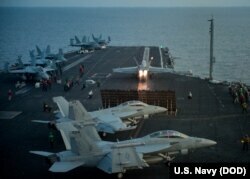 But the Vinson is going to be part of our ensuring that we stand by our allies in the northwest Pacific." 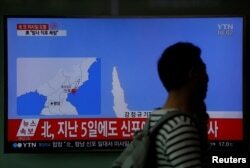 A passenger walks past a TV broadcasting a news report on North Korea's failed missile launch from its east coast, at a railway station in Seoul, South Korea, April 16, 2017. “Our deployment has been extended 30 days to provide a persistent presence in the waters off the Korean peninsula,” the group’s commander, Rear Adm. James Kilby, wrote Wednesday on the group’s Facebook page. "If you threaten them and your threat is not credible, it's only going to undermine whatever your policy toward them is," said North Korea expert Joel Wit at the 38 North monitoring group, run by Johns Hopkins University's School of Advanced International Studies. Analyst Daniel Pinkston with Troy University in Seoul, said this policy of increased military pressure is not only weakened by mixed messages over deploying a naval strike force, but also by widespread opposition among important allies such as Japan and South Korea. “They are not going to support some military adventurism to take a gamble with the execution of some preventive military operation against North Korea. It’s just not going to happen,” Pinkston told VOA. 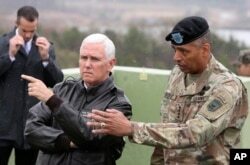 U.S. Vice President Mike Pence, left, is briefed by U.S. Gen. Vincent Brooks, right, commander of the United Nations Command, U.S. Forces Korea and Combined Forces Command from Observation Post Ouellette in the Demilitarized Zone (DMZ), near the border village of Panmunjom, South Korea, April 17, 2017. Pence instead repeated stern warnings to Pyongyang that he made earlier in Seoul and Tokyo, not to test America’s resolve. He again referenced Trump’s decisions to launch missile strikes in Syria and Afghanistan, and said the United States is fully prepared to use military force if needed. “Those who challenge our resolve or our readiness should know, we will defeat any attack and meet any challenge and use conventional or nuclear weapons with an overwhelming and effective American response,” the vice president said. The USS Carl Vinson strike group includes the flagship aircraft carrier, along with its air wing, destroyers USS Wayne E. Meyer and USS Michael Murphy and the cruiser USS Lake Champlain.